Some roads are flooded from thunderstorms in Sebastian, Florida. 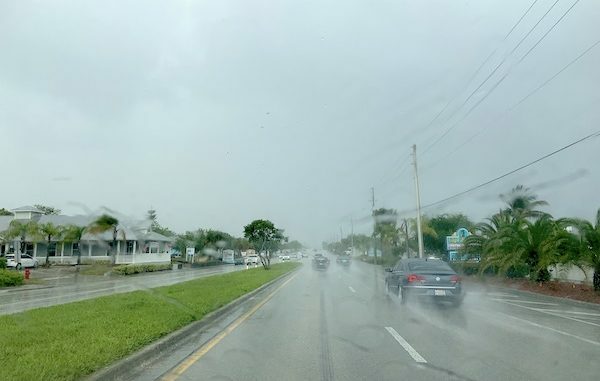 SEBASTIAN – Residents in Grant, Micco, Roseland, and Sebastian experienced dime to quarter size hail with wind gusts of up to 50 mph Wednesday morning. “It’s hail! Haven’t seen this in a while,” Roseland resident Dexter Diehl said. At 9:00 a.m., Sebastian Daily reported the severe thunderstorm warning with hail as it moved into areas of Grant, Micco, and Sebastian. Quarter size hail was reported in areas of Barefoot Bay and Micco. The cluster of thunderstorms finally moved into Sebastian at 10:00 a.m. causing lightning and dime size hail for several minutes. “We are on Clearmont by the Taco Mobil, and it was like the bottom dropped out of the sky,” Ang Hussey told Sebastian Daily. Wind and High Surf Advisories until late tonight. “Dime sized hail at Home Depot in Sebastian on U.S. Highway 1,” Dan Johnson said. “I’m in it right now! Stuck in my car as it’s being pelted! Sounds like my windows are going to break,” Christina Vino said. 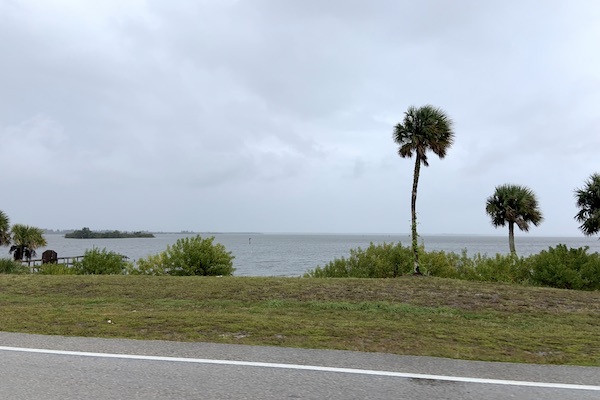 At 10:30 a.m., several boaters who were caught by the storm were seen returning to the public boat ramps. Many people didn’t know a storm was coming. Rain and thunderstorms are expected through tonight in Grant, Micco, Roseland, and Sebastian. A flood advisory is possible. The low tonight will be 63 degrees. 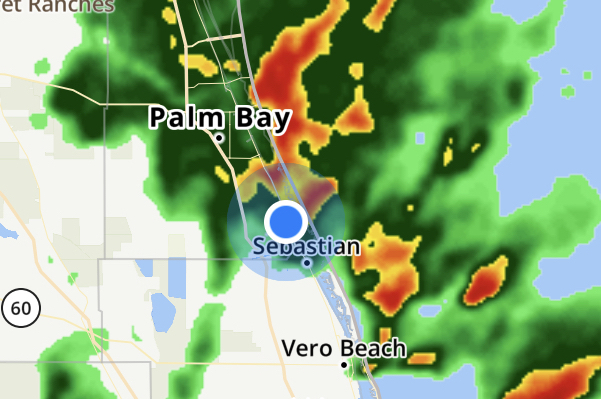 Weather radar at 12:25 p.m. in Sebastian, Florida. The rain should be clearing by Thursday. The high will be 77, but wind gusts will be up to 30 mph. A Wind Advisory and a High Surf Advisory are posted until late tonight.